Being an Asian, I'm no stranger to dumplings, otherwise known as jiaozi (boiled dumplings) or guotie (pot stickers). The existence of this common Chinese dish dates back to well before Jesus was born. 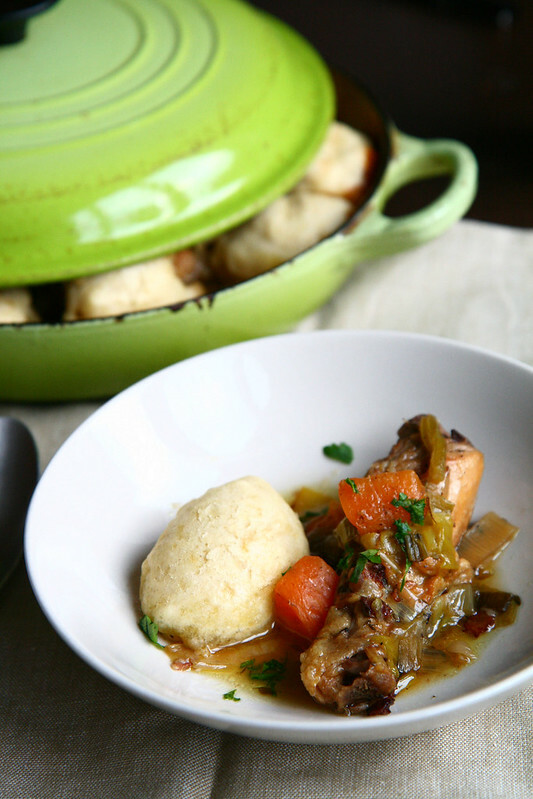 But chicken and dumplings together in a pot? The idea is foreign to someone who's used to pan frying them. Having read so much about this southern/mid-western delicacy, I was curious enough to give it a go. 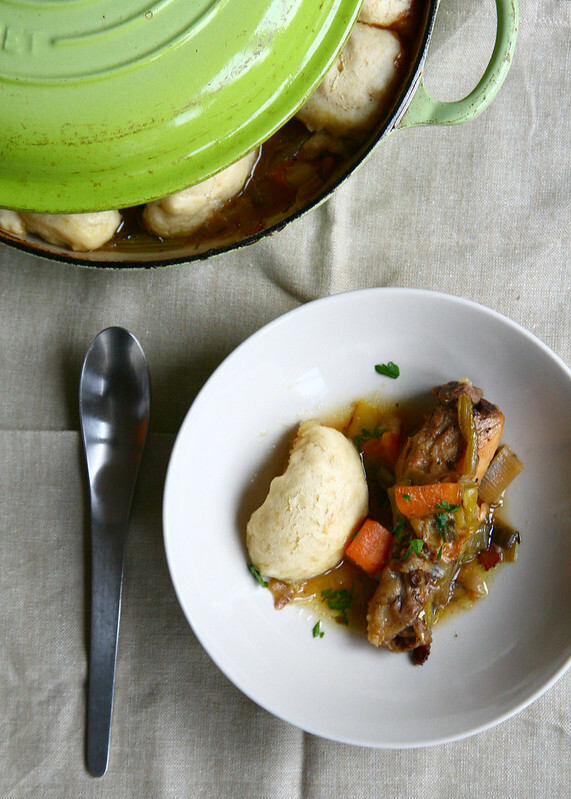 The chicken pieces are infused with leek and butter and then simmered in wine and stock resulting in moist and melt in your mouth goodness then triggers every taste bud in your mouth. Though a little apprehensive in the beginning, I was thrilled with dumplings. Soft, fluffy and delicate. Perfect for soaking up every bit of the scrumptious sauce. The hubs loved it so much, he ate just about every dumpling in the casserole pan. I decided to try out the recipe from Gwyneth Paltrow's cookbook, Notes from My Kitchen Table which I'd adapted a little. I prefer mine with more vegetables but there's no need to follow the recipe word for word with the exception of the dumplings. It's easier to guesstimate and follow your own taste buds. It's a straightforward recipe which requires a single pot and little washing up later (great new for those who hate washing dishes, like moi). 1. Preheat the oven to 200˚C / 400˚F / Gas 6. 2. Wash and dry the chicken. Remove the back and store it to make stock if you wish. Cut the chicken into pieces. 3. Season the chicken pieces with pepper. There's no need to add salt if you're using stock cube. Heat butter and olive oil in the largest, widest ovenproof pan you have (26cm or 30cm in diameter). Thoroughly brown the chicken pieces. It takes 5-8 minutes. 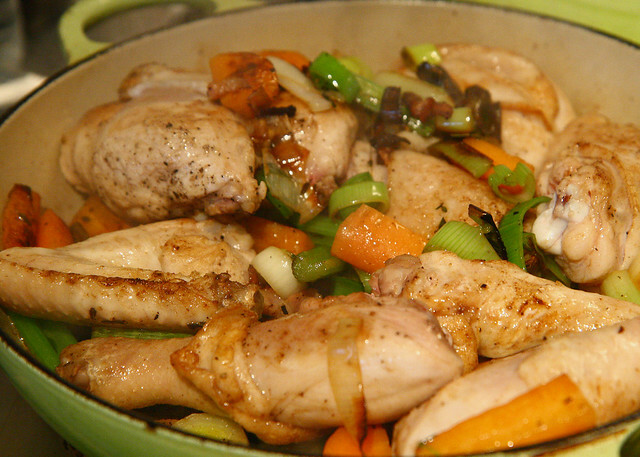 Remove the chicken and leave fat in the pan. 4. 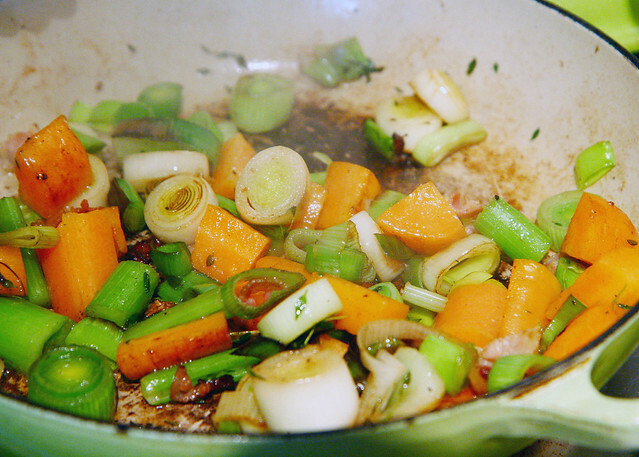 Add the vegetables, bacon and thyme to the pan and cook for 10 minutes over medium-low heat. Return the chicken to the pan. Add the white wine, bring it to the boil so that the alcohol evaporates. Season with freshly ground pepper. Pour in the stock and water. 5. Turn off the heat, put the lid on and cook the chicken in preheated oven for 1.5 hours. 6. Meanwhile, combine the flour, baking powder, cream and fine salt together in a bowl. Take the pan out of the oven and scoop large spoonfuls of the dumpling mixture on top of the chicken. You should end up with about 10 dumplings. 7. Cover the pan and put back in the oven for 10 minutes. Sprinkle with parsley. Serve immediately and spoon plenty of the juices over each portion. I absolutely love dumplings! This post reminded me that I need to go out for yum cha this weekend. I've actually never had them this way, it does look simple and the one pot and minimal washing up is certainly appealing! We tend to shy away from dumplings due to its heavy association but this looks super yummy with more than enough veg to balance - will definitely give this a try! Wow, that looks really yummy! I'll have to give it a go! I bet my husband will appreciate this. I have always grown up to eat dumplings as stuffed with something, but the American-style has the dough and meat separated! I think I still prefer mine boiled and the frozen ones from Wei-Chuan are my favorite non-homemade ones! looks delish! I have that exact same pot and love using it for just this sort of thing. especially in colder months. My goodness, i have a weak spot for soup. Yours looks very hearty and comforting. I like how it doesnt require 20 ingredients yet the result is phenomenal. A must try. Thanks so much for sharing. I love fried dumplings, I usually have them as midnight snack when I'm usually go hungry after 2am hahahaha. I often make dumplings to go on different stews and soups but I make mine with cornmeal (polenta) flour, butter and milk. Can also add different herbs to flavour them. They are much lighter than suet ones, which I don't really like and find too heavy. Oh my goodness. I love this. I must make this! I'm making this right now! It smells amazing, thanks for the inspiration! After watching Hugh's Three Good Things last night, I really feel like chicken. I assume the chicken stock goes in after the wine...? Hi Sarah! Yes, let the alcohol evaporates first and then add the stock. Hope you like it! It was so delicious!! and easy! i loved the dumplings. my husband and i may have polished off the whole thing... will definitely be making again. Sarah, so glad you liked it. My hubby has been hinting about them again. I may require some motivation before making the dish again (a lovely Hermes bag would be nice. Just kidding. Or maybe not). Love the pot you're using - it looks like such a homey comfort food meal! Love it. This looks like a nice hearty dish that would be perfect in the cooler months. I must confess I've never had western dumplings before. Hubby and I need to wrap some jiaozi soon. Nothing beats homemade ones and we love them in the winter. Gorgeous food pictures as usual. Love the green of the pot too! omg please come over and cook for me PLEASE!!! YUMMMMMMMM! im drooling. xO! Thanks for sharing! It looks sooooo delicious! This looks delicious, my mouth is watering! SOS!! I ended up with a thin batter with 500ml water and 125g flour which just ran into the casserole and dissolved, so no dumplings. Can you help? I'm so sorry!! I've put the 500ml water bit under the ingredient list for dumplings when it should've been for the chicken stew. The instructions are in the right order. My fault entirely! Bless you for that clarification: will try again very soon as the chicken-y part was ultra tasty so no worries. I was too trusting of you (shows my naive faith in cookery books - never leave your brain on a coat pet even within the pages of culinary tome). Well, just goes to show that I can't follow a recipe to save my life, including typing one out! BTW, I've actually adapted the recipe - this one's my version. Wow! This looks really delicious!!! Oh my goodness, Marlene did you take these photos? They are incredible!! Your food styling and photography is beyond par, I seriously oohed and ahhed over these pics before realising I wasn't flipping through a professional cookbook. The rustic quality of these pics actually remind me Jamie Oliver's food photography. As for the dish, these are the fanciest chicken and dumplings I've ever seen! I'm use to seeing them served up sloppy like cafeteria food. oh my God.. I'm going to try this. Never tried to make dumplings at home, but I think it's time to give it a try. I'm printing the recipe as I write this! My mouth is watering. It's 11.32am here in Melbourne, Australia and i'm already thinking of dinner! I must must give this a go some time soon. Thanks for sharing this!